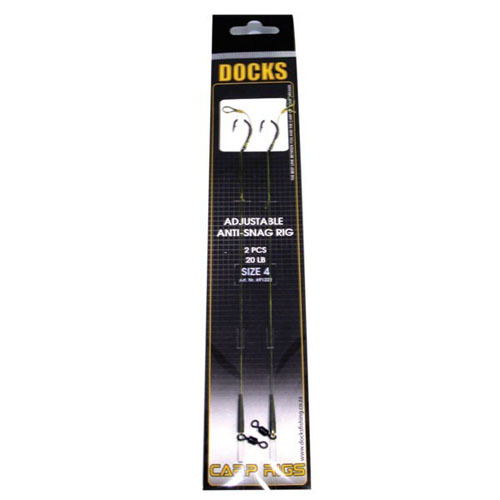 Adjustable Power rigs are fitted with Docks Turn Down Hooks and feature an adjustable length hair. 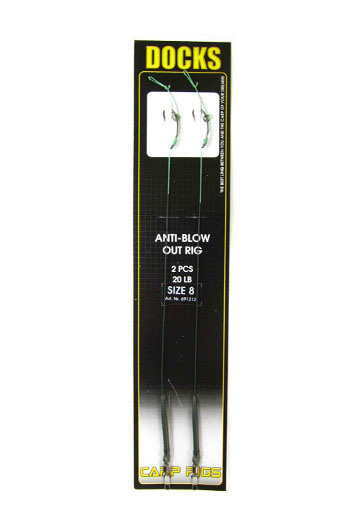 This allows one to adjust the length of the hair to suit the size of the bait. Made with 20LB Camo Green neutral bouyancy braid. Supplied with swivel and fitted with an anti tangle sleeve. Anti Blow out rigs are fitted with Docks Turn Down Hooks and a 3.1mm Round Ring. Made with 20LB Moss Green Coated braid, the coating has been removed for a length of 3cm from the hook to create a combi rig effect. Pre-tied to a swivel and fitted with an anti tangle sleeve. 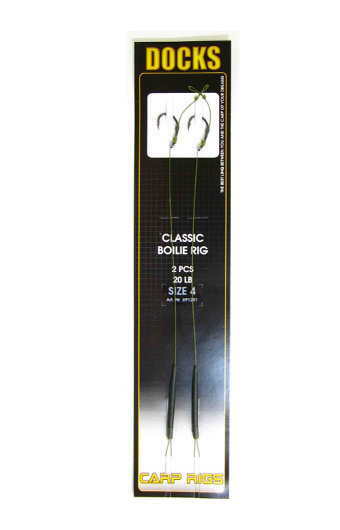 Classic Boilie Rigs are fitted with Docks Classic Hooks and are made using 20LB Moss Green Neutral Buoyancy Braid. Supplied with anti tangle sleeves. 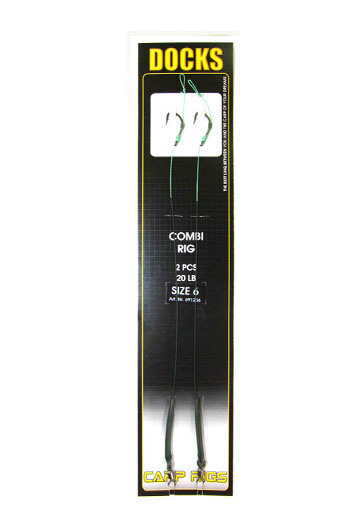 Combi Rigs are fitted with Docks Anti Snag Hooks and are made using 20LB Moss Green Coated Braid. The coating has been removed for a length of 3cm from the hook to create a swivel effect. Convenience has never been this easy! 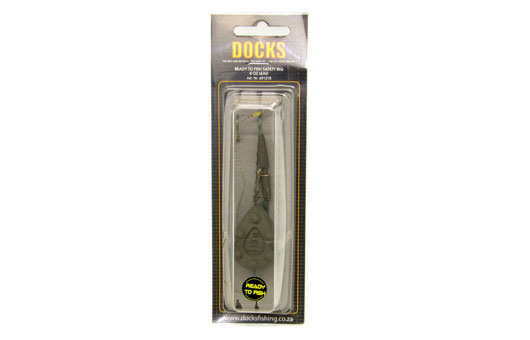 Simply tie the rig on and bait up and you are ready to target big fish using the Docks Ready to Fish rig. The In-Line Rig has a 3oz sinker, Liquid Wire leader and quick change swivel and sleeve with hook link and #6 Gripper Hook - Ideal Rig for casting. Simply tie the rig on and you're READY TO FISH. quick change swivel and a camo green combi hooklink with a size 6 anti snag hook. istance safety clip with quick change swivel and a camo green combi hooklink with a size 6 classic boilie hook. Anti Eject Combi Rigs tied in translucent brown Strip-Teaze and have a nominal overall length of 9 inches (23cm). Perfect for Bottom Baits or Pop-Ups. A classic combi-rig, using the legendary, ever-reliable, Mugga hook/knotless knot combination. Fishing with a Chod Rig is a supremely versatile method, ideal for presenting hook baits over a vast number of different lake and river beds. 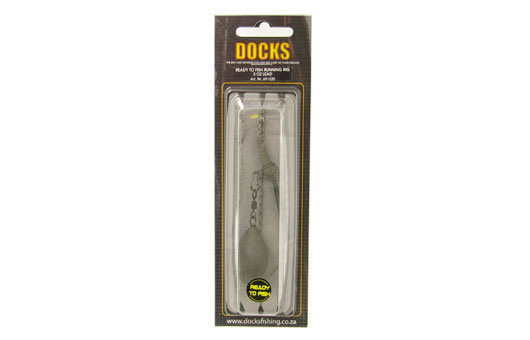 D-Ceptor Hook - designed specifically for use with stiff and mono type hooklinks. Probably the most versatile carp rig you can buy, the Chod Skin Rig is devastating in so many situations. 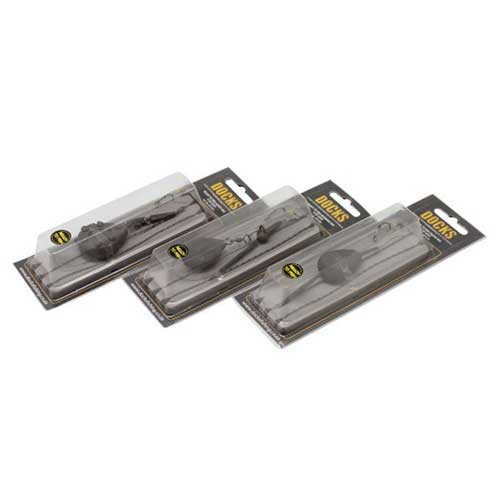 Covert Wide Gape Talon Tip hook for maximum strength and deadly hooking ability. Perfect for patchy gravel/weed situations but suitable for a multitude of scenarios because the Disruption's segmented camo colouration helps to break up the outline of the rig for an effective disguise. The combination of a blow back hair and Covert Hook Aligner gives this rig excellent hooking and anti-eject properties. The Gardner Tackle Pop Up Hook Aligner Rig is perfectly tied with a Covert Incizor Hook to give you an ultra effective presentation that is versatile and devastating! This combi-rig lies totally flat on the bottom guaranteeing pukka presentation at all times. A rig lying flush to the lake bed is less likely to be noticed by wary fish. Designed to cope with the most arduous and demanding situations, Sly Skin Rigs are strong enough to land big fish from heavy weed and when pulling fish from snags.